Quantitative measurements of cerebrospinal fluid flow through the ventriculo-peritoneal shunt using radioisotope were carried out on 34 hydrocephalic patients (18 children and 16 adults) and the relationship between the flow rates and the computed tomographic (CT) scan images was studied. 1) The flow rates in the prone position was 0.04–0.20 (mean+S.D., 0.10+0.05) ml/min in 13 patients whose shunt systems were functioning adequately. There was a good correlation between the flow rates and closing pressures of the shunt valves. 2) The 21 patients with malfunctioning shunt systems were devided into two groups as follows; the obstruction or lower flow group in which shunt flow was in 0–0.05 ml/min and the overflow group with rate over 0.20 ml/min. In the former group, there were 3 cases in which the shunt flow in a sitting position was very low and the cause of the malfunction was thought to be placement of an inadequate system with a higher pressure valve. 3) In 4 cases of 5 children in which the ventricles were of normal size during shunt malfunction, their ventricular sizes on CT images changed to small or slit-like ventricles after shunt revision. 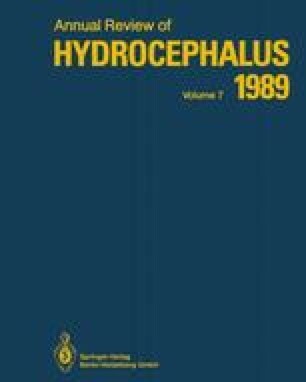 4) A few cases of hydrocephalic adults, in which the shunt-catheters were thought to be obstructed with no shunt flow in the prone and sitting positions showing no progressive dilatations of the ventricles on CT images, were diagnosed with the added findings of RI cisternography as shunt-independent arrested hydrocephalus. In the diagnosis of shunt malfunction and selection of the most adequate system in shunt revision, it is necessary to analyze together the data on CT images, quantitative measurement of shunt flow rates and RI cisternography as well as the clinical manifestations.